BELLE GLADE, FL--(Marketwired - December 07, 2015) - Injury Center of the Glades announced that their new facility will be opening on December 10th in Belle Glade. The grand opening of the state-of-the-art chiropractic care and accident injury treatment center will run from 4:30 p.m. to 5:30 p.m. and will offer light refreshments as well as a ribbon cutting ceremony at 5 p.m.
"We're very excited about our new facility," said Dr. Ivan Cohen, chiropractor at Injury Center of the Glades. "The building has been fully renovated and a features state-of-the-art facilities that will allow us to bring a high level of care to our patients." The chiropractic group has been practicing in Florida since 1999 and specializes in accident injury treatment. They focus on merging both chiropractic care and medical treatments to maximize their patient's recovery. Injury Center of the Glades was voted as one of "America's Top Chiropractors" by the Consumer's Research Council of America, and Dr. Cohen believes this new facility will allow the group to continue building on their reputation for excellent care. "When people step into our new facility, they'll know that we're serious about helping them overcome injuries and recover from their accidents," said Dr. Cohen. "We'll really be able to tailor our care to the needs of each patient who comes through our door." The new facility is located at 241 SE 1st Street in Belle Glade. Patients can make an appointment with Injury Center of the Glades before their grand opening on December 10th by calling them at 1-855-5-GLADES or 561-996-9936. They may also contact the clinic through their website at www.gladesinjurycenter.com. 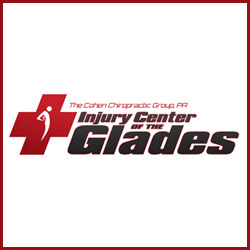 Injury Center of the Glades has been serving the greater Glades community since 1999, employing an integrated approach to treatment that merges chiropractic care and medical strategies. Injury Center of the Glades is able to treat injuries of the back, neck, head, shoulders, knees and extremities through a broad array of therapy options. The staff at the clinic work to reduce stress and pain following an accident by handling insurance paperwork, booking appointments in advance, and providing regular reports of the recovery process.